“France was the first country in the world to build a jet aircraft which allowed economic training, the Fouga CM 170. On account of its technical qualities, the Magister was the first training aircraft capable of ensuring a pilot’s complete training.” – from the kit instructions. 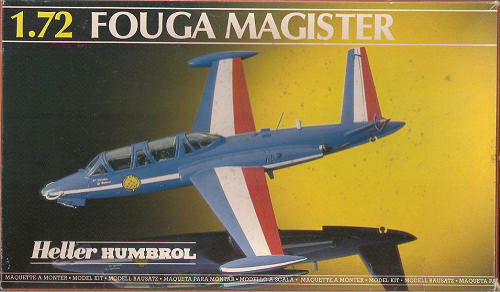 The Magister is a very distinctive aircraft. It sits close to the ground on short tricycle landing gear, has a long “glasshouse” canopy and of course the “butterfly” or “V” tail. Being easy to fly and relatively cheap to maintain means the Magister has been very popular as a privately owned aircraft, and one source suggests about 40 are still flying privately worldwide! Here in New Zealand we were fortunate to play host to one such aircraft which arrived in 1998, shortly thereafter being painted into Patrouille de France colours. This syndicate-owned aircraft, cunningly registered ZK-FGA, was very popular at airshows around the country. I was fortunate to see her fly at least twice at different shows, and was very impressed with the attractive machine with the big performance. Tragically, while practicing for an upcoming show, the aircraft was lost with both crew in March 2004. I’ve been after this kit for years, so when it appeared in an online auction lot I jumped in on the bidding. This is a classic Heller kit: big thick sprues, fine raised detail, accurate lines and darkish grey plastic. Considering the size and age of the kit I’m very surprised at the cockpit detail. Seats, control columns with detailed boots, two instrument panels with raised (blank) dials but no sidewall detail or anything on the side consoles. Pavla do make a resin set to replace everything and give you loads more detail. No nose weight is called out, which is just as well as there’s nowhere for it to go. This really is a thin aircraft when you compare it with the standard WW2 fighters I tend to build. The nosewheel bay features some ribs on the fuselage halves (as do the main bays and all the gear doors). An oval bulkhead is supplied to fit in front of the cockpit and the main bays are boxed in. Being a trainer there’s not much “going on” other than antennae, and these are very well represented. I’m certain I will lose a couple when decaling but I will install them all regardless. The only options are regarding two types of wingtip tanks, instructor’s periscope for the West German aircraft, and the nose…handles?...and smoke pipe for the French options. The biggest let-down for this kit is the clear sprue. The parts are very thick, as are the canopy frames. However, at least the lenses for the nose and wingtips are provided. There is at least one vacform replacement available for the one-piece canopy. The decals give two main options: AA-193 of the West German air arm in 1966 in overall silver, and the Patrouille de France in 1978. Heller were kind enough to cater for any of the 11, that’s right eleven, aircraft of the team, complete with crew names. They also generously provide much of the white areas in the very distinctive colour scheme (fuselage and tiptanks), but it is (understandably) up to the builder to paint the white on the wings and “butterfly” stabilisers. Unfortunately mine have yellowed slightly due to age, but I am contemplating a hypothetical scheme anyway. Several aftermarket sheets are out there so that you can pick something a bit more exotic. I believe this is the only game in town for a 1:72 Magister (there’s at least one other, an older and simpler Airfix kit), and it stands up pretty well. OOB it will make a great little replica, but with the aforementioned Pavla cockpit set and some scribed panels it will be a showstopper.